Does Vern Rapp have a bad rap? Most importantly, he’s come to terms with the defining controversy of his major league career. Rapp’s stormy tenure in St. Louis overshadowed his minor league mastery. He interrupted his playing career for military service in the Korean War. 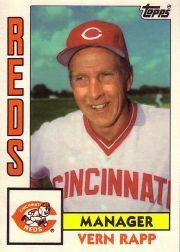 Seeing that his chances as a big league player were limited, Rapp became a player-manager in the minors at age 27. Skipper Rapp became minor league baseball’s Muhammad Ali, coming out of retirement again and again. Once, he pitched. His last pro pinch-hit came at age 48. Why? Was he teaching, or just enjoying himself? Rapp seemed unaware of being a part of baseball media lore. According to one legend, a tongue-in-cheek retirement tribute to Rapp by a Boston sports radio station turned serious. The tributes rolled in, culminating in a job offer from the Cincinnati Reds. What does Rapp recall of that day? I asked about his demand for clean-shaven Cardinals. “Mad Hungarian” relief ace Al Hrabosky got madder, saying that he needed menacing facial hair to keep his edge against hitters. Would Rapp handle the situation differently today? Has he spoken with Hrabosky since? “That question is history. I’m enjoying my life very much. Audrey and I will be married 60 years in May, 2011. Four daughters, 15 grandchildren and four great.